A few weeks ago, the Capuchins Franciscans (the Franciscans that inspired the naming of the Cappuccino and the Capuchin monkey because of the resemblance to their habit) near Catholic University sent out an invitation to all the religious in the area: “Holy Hour followed by a performance by the Hillbilly Thomists.” Pictured on the flyer was exactly what one would expect: Dominicans in habit playing banjos. To be honest, I could not think of a worse combination of events in an evening: adoration (a devotion that simply doesn’t make sense to me… but that probably requires a full post to explain), coffee (of which I’ve never had a cup in my life), Dominicans (our rivals, who, I would like to remind everyone, we beat in softball this year), and bluegrass music (need I have an explanation for this one?). A few weeks ago, I had not planned on attending. As of two days ago I still hadn’t planned on attending, and figured most others felt the same way. I was wrong. Two guys in my house were really excited about it; I found out that undergraduate students would be there, giving up a Saturday night in college to go to a religious house; many of the other religious mentioned how much fun it was going to be. Really? I still didn’t think so. But I admired the initiative to start something new, to bring people together. One Capuchin said that it was an experiment: if it worked, they were going to do them frequently with different performances. Alright, I said, I really need to go, if for nothing else, to support guys who were extending themselves and taking a risk with a creative event. Who knows? The next one might be better. Let’s just say that I underestimated just about every aspect of the night. I was worried that it wouldn’t have enough support: it was standing room only in a large chapel, and almost impossible to move when we transitioned to the basement. I was worried that adoration would be a bit strange, even awkward: the music was fantastic, the energy was tangible, and the preaching was some of the best I have heard, ever (even theologically, I found myself so caught up in the living, breathing body of Christ all around me that I didn’t find myself thinking about how strange it was that everyone knelt there for an hour staring at what should be consumed, I just adored Christ like everyone else, seeing him in my brothers and sisters gathered in great faith.) I was worried that the music would be super lame and that the Dominicans would be formal, pious, and reserved (as has been my experience): the music was so catchy and fun that I couldn’t stop clapping my hands, tapping my foot, and laughing at the great show. All in all, it was one of the most fun nights I’ve had all year. Last night and today, I couldn’t help but reflect on how creative and effective this was by our brother Franciscans. They found a way to bring together men from five different religious orders and two diocesan seminaries (who, surprisingly enough, do very little together), include as many undergraduate students as there were religious, offering an opportunity to mingle with lay people in a really un-intimidating way, and create a powerful environment for God to touch us all. I think even we as religious can forget the power of intentional, spontaneous prayer in our lives. We prayer multiple times of day, go to mass often, and keep a very good schedule. But when do we go out of our way like this to bring 100 people together who want to be there for no other reason than to praise God? I think people are hungry for this sort of stuff. They want to go out of their way to do something new, something fun; they want to be prayerful people, surrounded entirely by people that want to be there, sing all of the songs, and don’t care what time it is. In a lot of ways, I don’t think it matters what you do if you have people like that coming together. 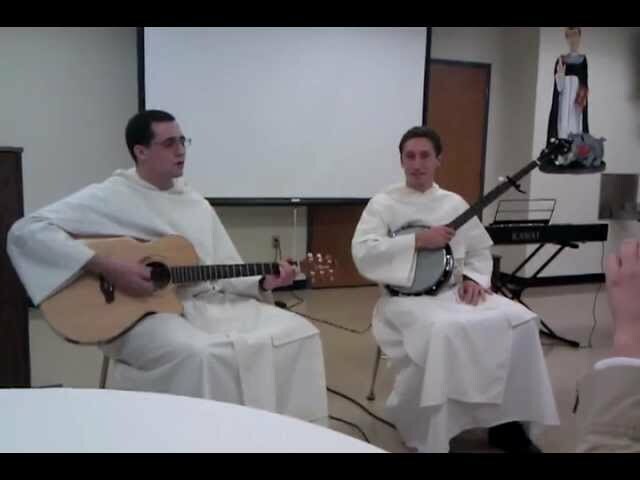 Even if it’s banjo-playing lovers of Thomas Aquinas playing at a [religious] fraternity house. I’ve said it before and I’ll say it again, I think we as a Church need to think outside of our status quo, to stop waiting for people to come to us and instead be creative with the way we engage people with our lives. I look at something like the “Mass Mobs” in Buffalo and think, “How simple. How brilliant.” I see someone like Sister Cristina, the “Singing Nun,” using her talents and faith together to creatively re-brand the popular song “Like A Virgin” in such a powerfully Christian way. I think about our friars who have a chapel in the place people go most: a shopping mall. What are the ideas of tomorrow? Whatever they are, they’re going to have to be creative, attractive, inspiring, and new. A hillbilly frat party is certainly a start. Hi Casey, This post is well written; however, one line jumped out and actually bothered me – coming from someone with as many years of religious studies as you. You wrote, “Adoration – a devotion that doesn’t make sense to me”. Could you write that “explanatory post” soon? That one line definitely needs more clarification. Sometimes it’s a matter of how we say things that gets someone’s attention; that got mine. Jesus instituted the Eucharist as a thanksgiving meal as a way for us to be united with our creator, to experience the incarnation by becoming the body of Christ ourselves. Adoration developed in the Middle Ages when people forgot this, shifting from a relationship with God to fear and unworthiness before God. The best they thought they could do was look at the Eucharist. The Church tried to encourage the full experience of Christ in 1215 by requiring all Christians to receive once per year. For me, it just seems like a plan B and missing it’s true intention: why would I stare at Christ when he intended us to consume him and BE Christ. I’m not saying that it’s a bad devotion, only to say that it is just that, a devotion, and that it doesn’t make sense to everyone. As I mentioned in the post, what was particularly powerful was seeing Christ not only on the altar, but so clearly all around me in my brothers and sisters. What? No porch, no straw, no dawg? Hillbilly? Nope. sounds like someone is actually breathing over there. Casey, it’s good that you went out for an evening. New experiences like that are good for the soul.